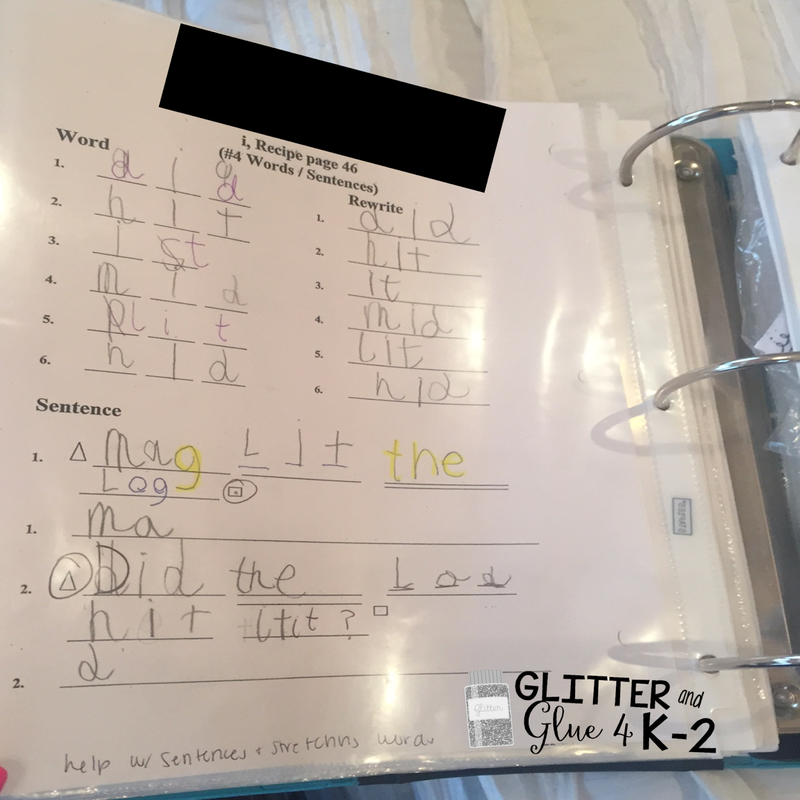 Glitter and Glue 4 K-2: 5 Tips to Stand out and Get Your Dream Teaching Job! 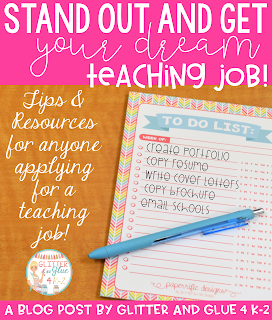 5 Tips to Stand out and Get Your Dream Teaching Job! As soon as I graduated, I started applying for jobs online. I would fill out the application on the school's website and wait to hear back from the school. I soon became discouraged because I didn't get a single response for even an interview. Luckily, I was offered an assistantship to get my Master's Degree and was able to put the job search off for another year. I was so blessed to get the opportunity for so many reasons! I was extremely fortunate because my assistantship gave me the opportunity to connect with some amazing teachers, professors, and future teachers who showed me that I was applying for jobs all wrong! I'm going to share my biggest mistakes as I applied for jobs and give you some tips to stand out in your interview process! *Please note, I'm sharing what worked for me in my job search. 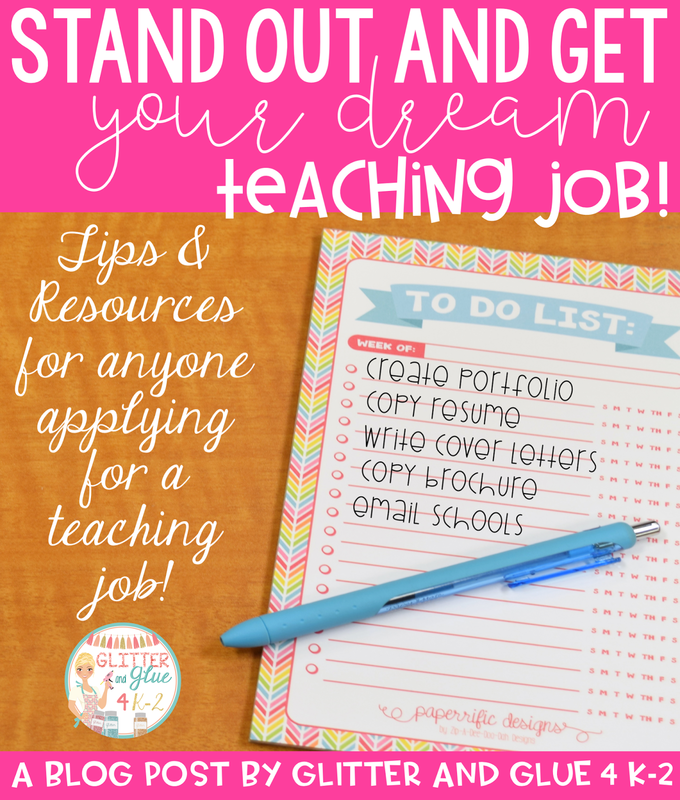 Be sure to do the obvious...create a resume, write a basic cover letter that you can easily tweak as you apply to schools, type up your references with all of their info in one place, get your letters of recommendations together. If you don't have letters of recommendation-be sure to ask for them now! Don't forget to get permission from your references to use them too! Spend the extra money and buy some resume paper! Print your resume, references, and cover letters on this paper! I know it can get expensive but it's worth it! 2. Set yourself apart and get the interview! When I applied for jobs, my first mistake was just applying online and waiting around! I look back and I realize what a silly mistake that was! In order to even get an interview, administrators want to see that you are dedicated and willing to go that extra mile! If the expectation is to fill out the online application, then you need to do that and go above and beyond! Email the administrators directly to reiterate your interest, go in to the school and personally drop off your resume, send brochures or something extra with your resume (see below)and let administrators get to know you! 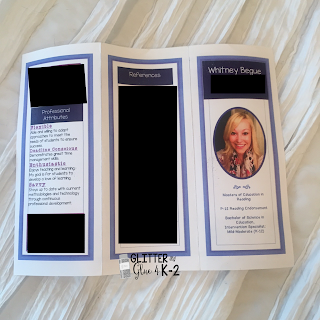 Check out the brochure I created below! Sorry I wasn't able to make this an editable template. Don't worry though, you can find a template in Microsoft Word that you can edit. Some things I included on my brochure were: photos of me teaching, why I became a teacher, career experience, relevant skills and training, my contact information, the degrees and certificates I obtained, and references. 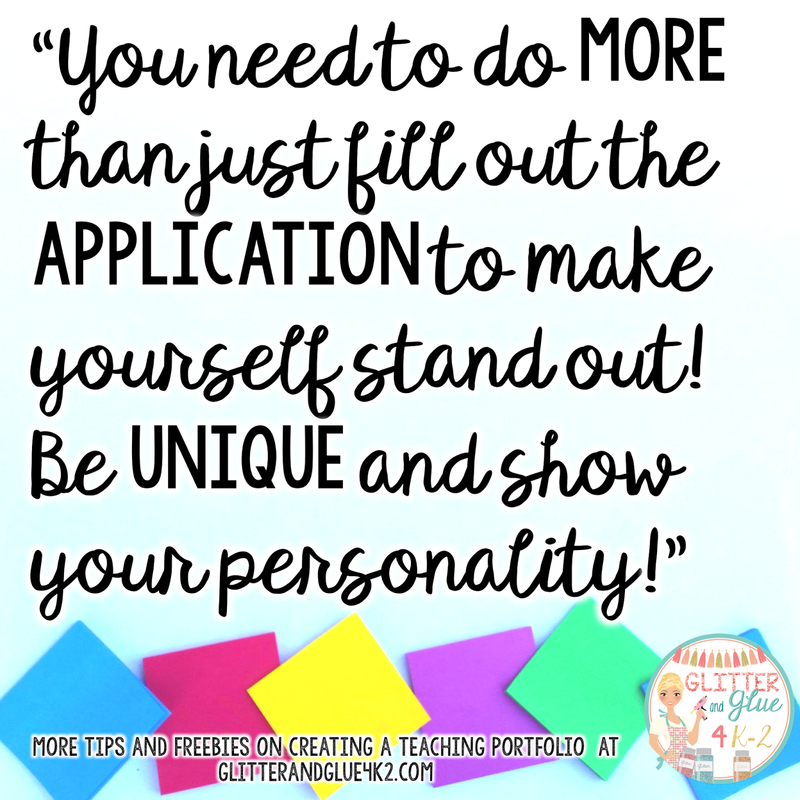 Don't worry, you're not being pushy, you're setting yourself apart from everyone who is just applying! The point is, you need to do more than just fill out the application to make yourself stand out! Be unique and show your personality! 3. Once you've got your interview, time to get ready! 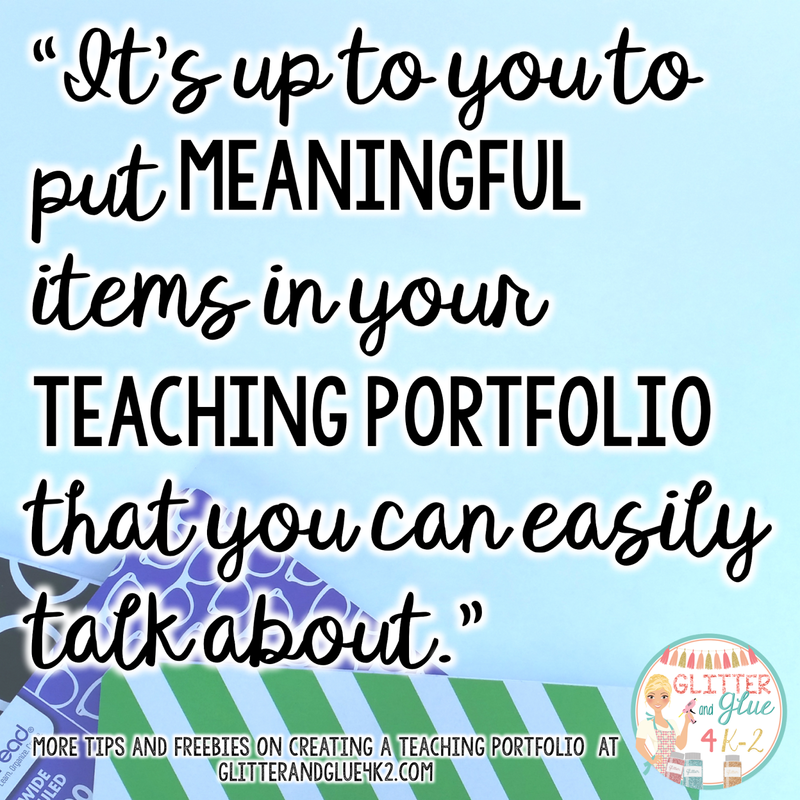 I can tell you that at every interview, I was almost always asked about these topics: classroom management, lesson planning, professional development, and communication with parents. 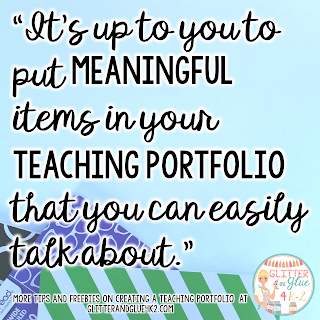 Since these topics are so important to teaching and so commonly asked about, I made sure to include information about each one in my portfolio! 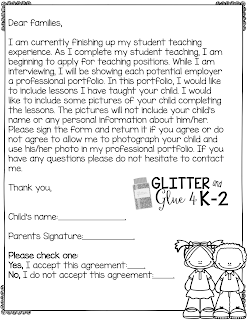 As your interviewers ask you about these topics, open up your portfolio to these pages! 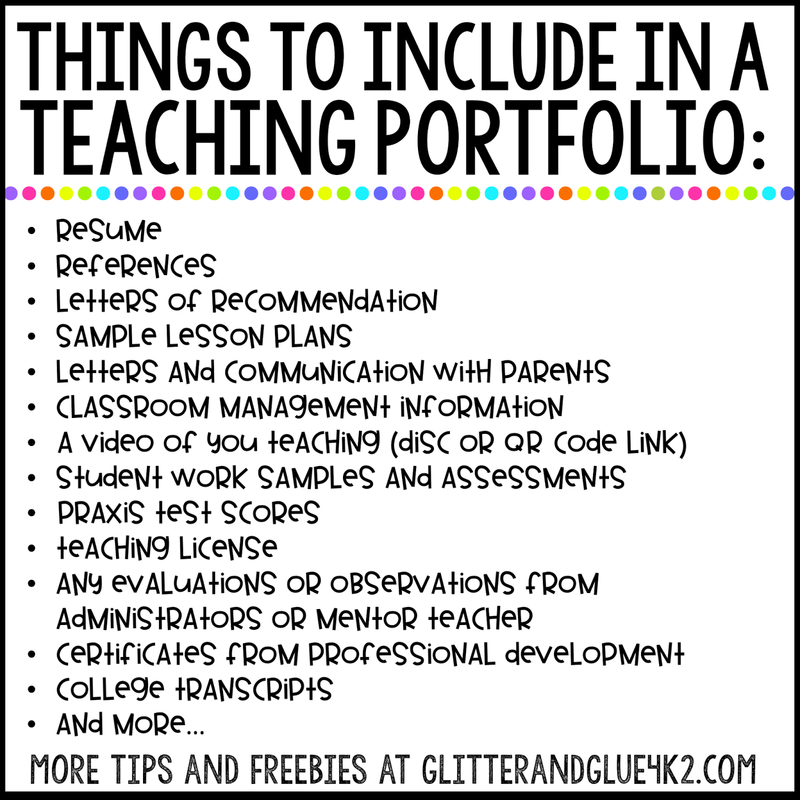 It is a great visual for administrators and it makes it easier for you to discuss each topic. Not to mention, it shows you are prepared, creative, and willing to put in the extra work! For example, if you are asked, "what does a typical lesson look like?" 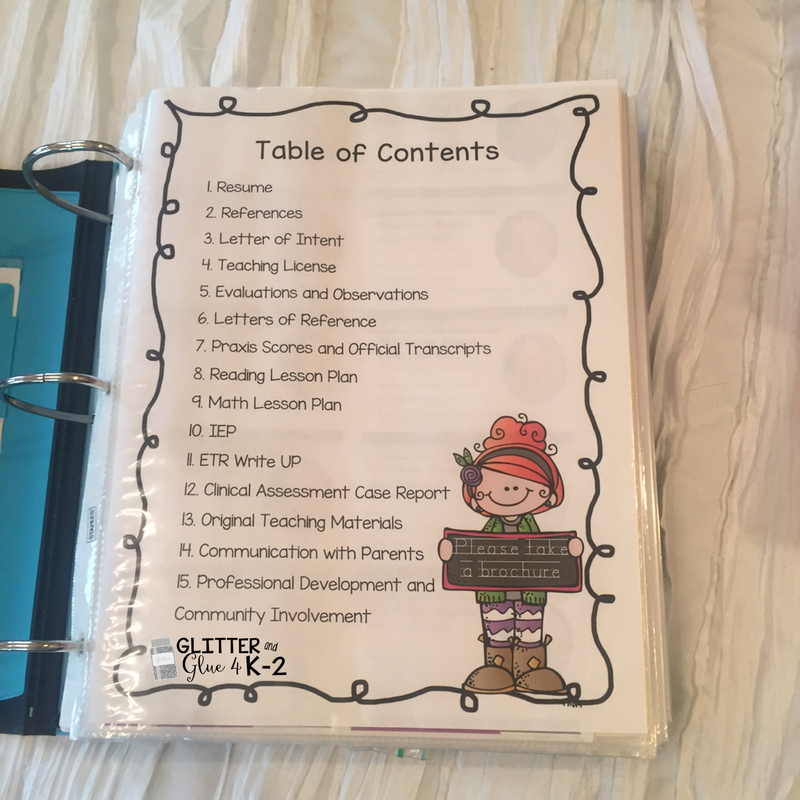 You can show the administrator a typed out lesson plan (complete with objectives, assessments, and all that good stuff!) along with photos and student work samples. Even if you're not in a teaching position, be sure to start collecting these things now from your student teaching! 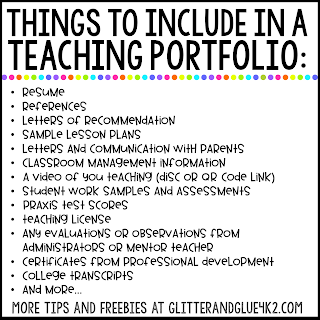 If you are looking for some ideas of things to include in a portfolio, some options are: copies of your resume, copies of your references, letters of recommendation, communication with parents, lesson plans, student work samples, classroom management information, a sample IEP, professional development certificates, Praxis or testing scores, college transcripts, evaluations and observations, resources you have created, a copy of you teaching license, a disc or QR Code with a link to a video of you teaching a lesson. One thing I have commonly notified in many teaching portfolios is a nicely typed out paper on the individuals' educational philosophy. Although this is great information, I can tell you that your interviewer will not likely sit there and read your entire paper. It's best just to know this information and work it in to your talking points as you interview. I would recommend saving this space for something else. 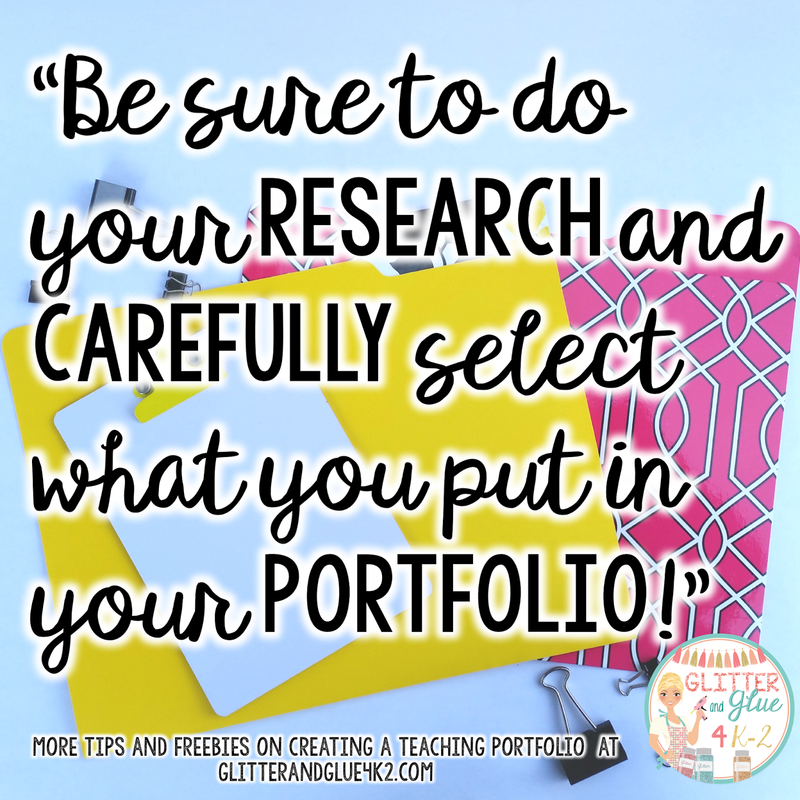 Obviously, what you put in your portfolio will change depending on your specialty. 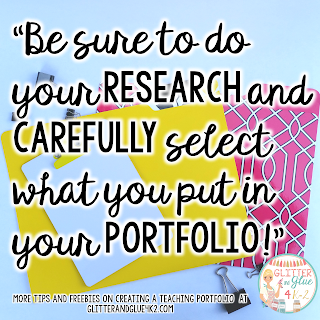 Be sure to do your research and carefully select what you put in your portfolio! Now that you have selected what will go in your portfolio, make it look nice! 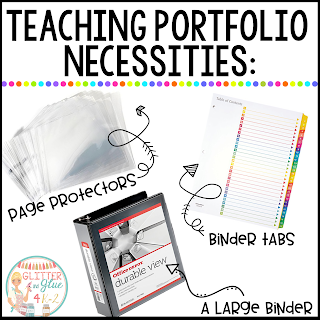 Invest in a big binder to put everything in and get some tabs to separate out each section. Don't forget to get some page protectors for each page (I might be slightly addicted to page protectors.) Be sure to give it a nice cover page and add a table of contents. I created mine using Microsoft Word! Don't worry I've included a few different options for the cover page and what I used for my table of contents free! Click here to get the cover and table of contents template! Click the images to grab some of my favorite necessities! When I made my portfolio, I started with the table of contents. I numbered all of the sections on one page so I could easily find everything. 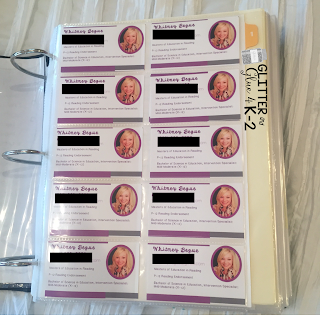 I purchased binder tabs with numbers so I could place each section behind the numbered tabs. 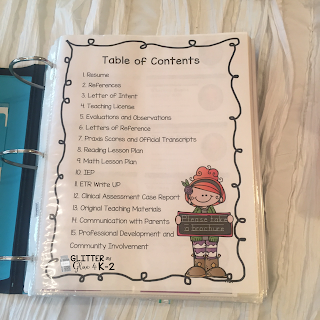 Below are some pages I included in my teaching portfolio. Hope they can give you some inspiration! Whatever you do, make it yours! I like to create things digitally so that's how mine turned out. 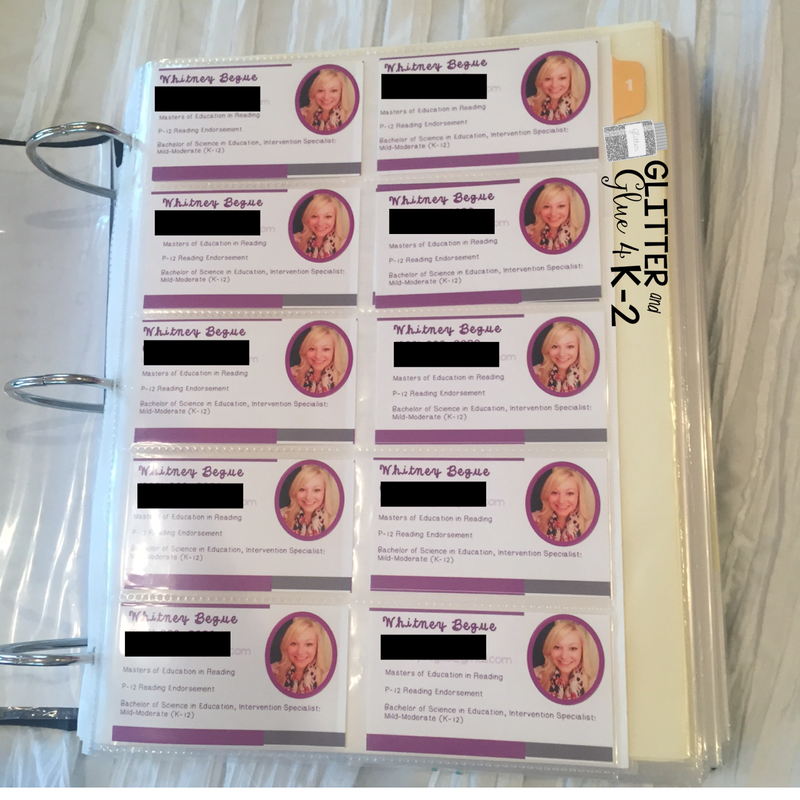 Looking back, it's not the most beautifully done but it showed employers that I can create things digitally and am (somewhat) tech savvy. Maybe you're a big scrapbooker? Make your portfolio scrapbookie!... I know that's not a word but you get my point! Make it unique and reflective of your personality! I was able to give these out or my interviewers could take them. Don't forget to add a cover! I tried to keep mine simple but still show my personality. I added my name, number, and email to the cover. I also added my favorite quote about teaching. 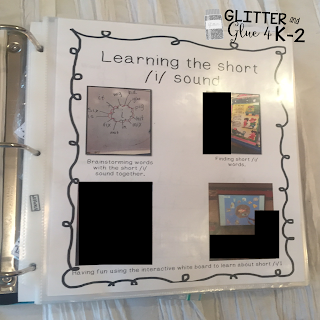 Below you can use my editable template or create your own and just use mine as inspiration! After you have had your interview, be sure to follow up within 24 hours. Don't let them forget about you! Some people suggest an email others suggest a handwritten thank you card. I suggest doing both! Neither has to be too long. 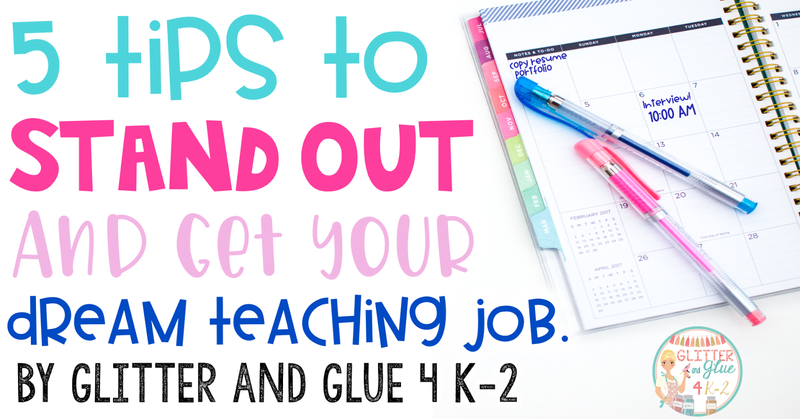 Just be sure to reiterate your interest in the teaching position and mention something specific that you talked about while you interviewed. Well I hope these resources and the information will help you in your job search. If I can leave you with one more piece of advice... Don't get discouraged if you don't get an interview, job offer, or exactly what you are looking for right away! Just keep trying and continue to better yourself as a teacher! I can tell you from personal experience that it is not easy but all of your hard work will pay off. Soon you will be doing what you love! How long after you applied online did you go to the principal/administrator and drop off your resume & brochure? Also when you go to drop off your resume and brochure did you wear a suit? I would say I took it in within a week or so and I did wear my suit in case I had a chance to talk with an administrator. What do you recommend if the job posting says "On-line applications only please."? 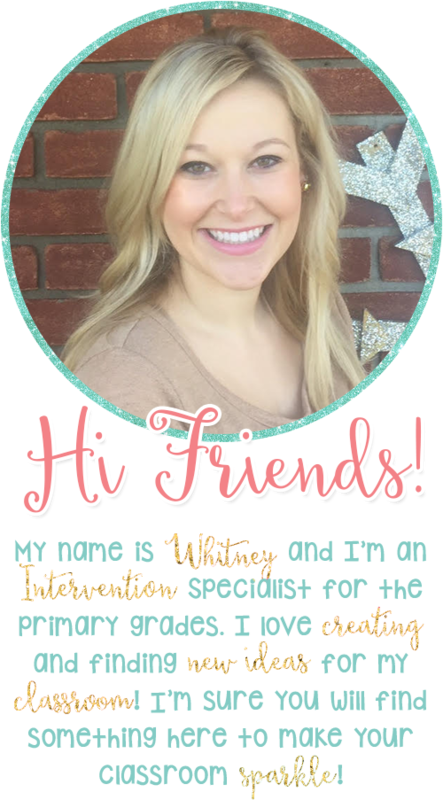 Hi Whitney, love your blog! If you already know the district you want to work in but are currently finishing student teaching and M.Ed program, do you have any tips on getting in touch with the administrators/principles? I met with the superintendent (family friend) to ask questions before I started my program, but now I know that it is where I want to end up for sure! I don't want to seem pushy/that I am expecting a job but would love to let them know my intentions and get my name out there! I am currently working as a literacy interventionist in an elementary school. I graduate in 2015 and worked in Texas for a year in an inner city middle school as a tutor and mentor. Now, I have been at my current school since August 2016. I've gone on a few job interviews and have been told I was really really close but they went with someone else. It seems I am competing with experience but how can I compete with experience when I can't get a teaching job that would give me that experience?? Hi Whitney! 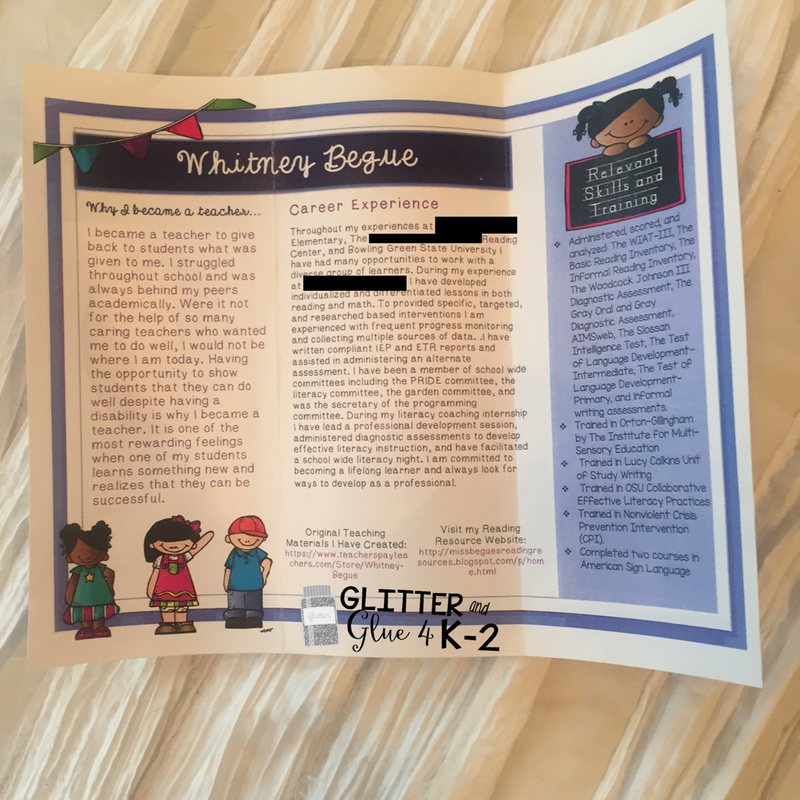 I am currently a paraprofessional for Kindergarten and am currently working on getting certified for early childhood. Since I am in technically in someone else's classroom, how would I go about getting student sample pieces for my portfolio? I am not responsible for the creation of lessons. etc. at this point so any ideas to include would be great. Thanks! Hello! I was on Pinterest when I stumbled across your blog! I just completed my first semester of student teaching, and I am now on Christmas break. I will begin my final semester of student teaching in the spring before graduating. I am already anxious about finding a job because I would love to graduate knowing where I will be teaching in the Fall. I noticed in the above comments that you mentioned applying 1-2 months before graduation. However, I am wondering how soon is too soon to fill out applications? Thanks! Hi, how many copes of your portfolio should you create? Or just have one? 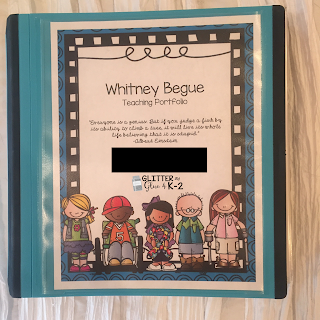 Hi, I love your portfolio covers!!! absolutely lovely. 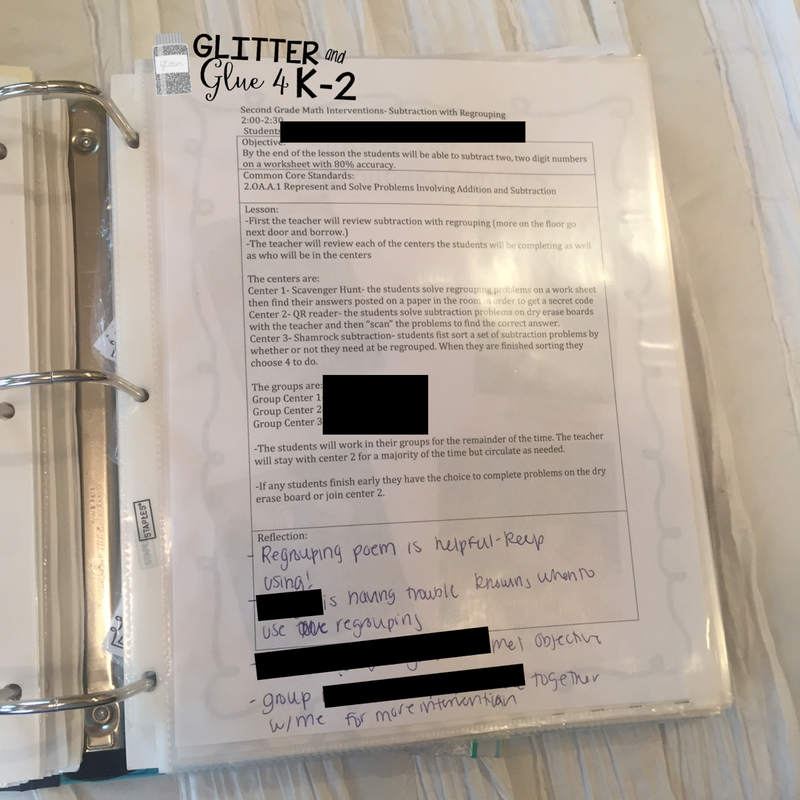 I'm a school nurse, is there any way I can edit it to say Nursing portfolio?